This page complements article "A Simplified GPS-Derived Frequency Standard" published in the September/October 2006 issue of ARRL's QEX magazine. This page also provides updates to the original article. Please visit this page frequently, and right before assembling the project, as new information will get added regularly. There is also a mailing list that you can subscribe to to stay updated. See details below. I would like to express my gratitude to Jocelyne, my wife.This project took 8 months of spare time to develop, so she deserves it! Also, thanks to Jacques, VE2AZX for beta-testing this system. For those who have not read the article yet, this is the best place to start learning about this project. Reproduced with permission. Copyright ARRL, 2006 all rights reserved. This material originally appeared in QEX: Forum for Communications experimenters (www.arrl.org/qex). Please report any broken hyperlinks to me. Thank you. This list is email-based and runs the Mailman engine. QTH.net is the host. This is a free, non advertisement-based service that is maintained using donations. You can read the postings anonymously or even send a post from the list website, but you have to register (email address required) to receive emails. The digest-form email is cool because it combines the the daily emails into a single one. I hope you join us there. It will be my pleasure to greet you in! A top quality, fully etched, double-sided bare PCB. The PCB also has solder resist film and component marking. A pre-programmed PIC 18F2220 micro-controller. I will be happy to provide you with procurement detail in my email reply. The 0.1uF capacitor I specified (478-2472-ND) from Digikey is now discontinued. Please order 478-3188-ND, , a RoHS-compliant equivalent. The 1uF capacitors can be replaced with 478-3195-ND, a RoHS-compliant equivalent. The Bi-color LED (MV6461A-ND) is obsolete. You can use Digikey part 160-1058-ND instead. Panasonic LN38GCPX (P607-ND, minimum qantity is 10). The LTC1485 (LTC1485CN8-ND) can be replaced with LTC1485CN8#PBF-ND, a RoHS-compliant equivalent. It must tolerate the supply rails you will submit it to (0 to +5V or -5V to +5V, depending on the OCXO to control). It must be of the Rail-to-Rail input and output type, otherwise you will lose some tuning range. A LM358 is not a good choice because of this. It must be able to drive the equivalent capacitance of the OCXO tuning input pin. In case an oscillation is seen, a 1K resistor added in series with the Tuning Output voltage should dampen any oscillation. It must (of course) have a DIP-8 package and have the same pinout. An Alarm Latch clear push-button feature which allows to clear any latched alarm without having to log on to the system via RS-232C. Grounding pin 22 momentarily will clear the alarm latch. A 10MHz/5MHz OCXO rate selection based on the state of pin 21. High (default, floating) state is 10MHz, Low (grounded) state is 5MHz. Selection is made at power up only. No change to the FLL functionality is made here. Version 4 (v4) of GPS_Std firmware can be downloaded below. See the Additional Assembly Instructions section for more details on how to wire the system and use the above features. Microchip has announced a bug in their latest chip errata. This bug holds the chip in reset unless the Power up delay feature is turned off. This applies to chips with date codes greater than 0813 (2008, 13th week). So a new firmware is required to be fully compatible with the newer batch of chips. Version 3 (v3) of GPS_Std firmware which corrects the issue can be downloaded below. A fault was found on the PIC v1 firmware when controling 10MHz OCXO in Voting mode. Version 2 (v2) of GPS_Std firmware which corrects the issue can be downloaded below. A small bug was found on the Montrol software statistics window. It will affect those who use a 5MHz OCXO. All statistics displayed were previously computed assuming a 10MHz oscillator, Version 3 of the Montrol software now detects when a 5MHz OCXO is used and calculates the stats accordingly. A couple of additional fixes are implemented. This update is available in the Montrol SOFTWARE FOR WINDOWS below. See the note in the Additional Hints below regarding using a low voltage version GPS Reciver. A small bug was found on the Montrol Windows software. It may or may not affect you, depending on your PC configuration. An access violation popup window may show up when trying to change the COM port using the "Config" button. If you experience this problem, uninstall your existing Montrol software and install Montrol version 2. This update is available in the Montrol SOFTWARE FOR WINDOWS below. I have only run basic acquisition and lock test with a 5MHz oscillator. I did not perform long term accuracy measurements so I cannot provide any indication on the level of performance obtained. I have every reason to believe that it will work well though. The output sub-rates will be 2.5MHz and 500KHz, which are odd frequencies from a frequency standard's perspective. Some software parameters will have to change for optimized performance. The user will have to experiment. An example, for a known Averaging Cycle Size (S), accuracy will be less; this is obvious since the measurement resolution of the system becomes one pulse in 80,000,000 instead of one in 160,000,000. A longer Averaging Cycle Size (S) will compensate though. I will make no modifications to existing documentation. Wherever you read numbers such as 10MHz and 0x6800 (26624 decimal), you should instead read 5MHz and 0xB400 (46080 decimal) if you are using a 5MHz OCXO. Starting in v4, the PIC firmware includes built-in support for a 5MHz OCXO. Previously, the frequency had to be specified at PIC programming time. I would appreciate reading back from the experimenters who build this project. This will allow me to improve this page by providing additional clarification if necessary. Thanks! Jacques, VE2AZX, was the beta-tester for this project. He did a pretty good job of integrating the system into an existing HP 5328A frequency counter with a built-in HP 10544 OCXO. Jacques provides this info along with some small mods/improvements to the PCB and some system spurs and stability analysis in one zip file available on his website. Thanks Jacques! Jeremy, AD7MK led their class project at the Idaho State University. They decided they needed a better standard for their lab, so they procured the PIC micro and PCB. After project completion, they ran their standard against a commercial-grade GPS standard (NIST-traceable) and were impressed with the results. See their webpage. I wrote a comprehensive user manual that describes VE2ZAZ's GPS-derived frequency standard. Topics such as detailed system description, hardware and firmware setup, serial port strings and commands are covered in the manual. This document is a must if you are looking for the information on how to put together the "Simplified GPS-Derived Frequency Standard". Integrated DAC plotting feature that graphs the DAC value as a function of time. Statistics window with average offset, standard deviation and min/max values computed. This software was developed and tested in a Windows 98 environment. It was also tested in Windows 2000 and Windows XP. Since these operating systems cover two main branches of Windows (9x and NT), the software is expected to run in all Windows environments from Windows 95 through Windows XP. Note to users: In order for Montrol to send a new Parameter value to the PIC, you must enter the parameter value in the numeric field and then press the <Return> key. A Parameter readback will confirm that the PIC took the new value. Version 4 (April 2009): This version corrects a minor display problem found in the Montrol software statistics window. Under certain circumstances, abnormally small but non-zero Current and Accumulated Average Frequency Offset values may display. 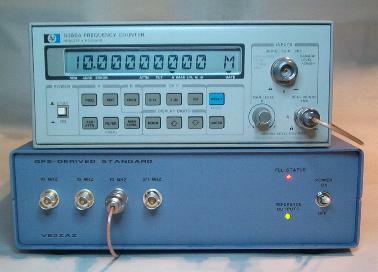 Version 3 (July 2008): All statistics displayed were previously computed assuming a 10MHz oscillator. Now detects when a 5MHz OCXO is used and calculates the stats accordingly. Serial ports COM5 to COM8 are now supported. The Plot feature is now much improved. Version 2 (September 2006): Corrects an access violation popup window problem that may show up when trying to change the COM port using the "Config" button. Version 1 (September 2006): Initial Release. For those of you who would like to make their own GPS_Std Frequency Standard system PCB, here are the top layer, bottom layer and top silkscreen layers saved in .PDF format. The document prints on Letter-size paper. When printing in full size (no scaling), the size and proportions should be accurate. This PCB can be made of double-sided copper clad glass-epoxy materal. A thickness of 0.062 inch is typical. The copper patterns reside on the PCB top and bottom sides. The board layout is designed so that signals jump from layer to layer using component pins. The user shall solder all components and wiring on both PCB sides in order to allow signals to jump. I also provide the latest HEX file required to upload the firmware load into the PIC 18F2220's program flash. This file is in 8-bit Intel HEX format, which is the industry standard for 8-bit micro-controllers. In order to accomplish the firmware upload, you need a PIC programmer that can handle the PIC 18F series chips. A 10MHz/5MHz OCXO rate power up selection based on the state of pin 21. High (default, floating) state is 10MHz, Low (grounded) state is 5MHz. No change to the FLL functionality is made here. Since this firmware version creates a "universal" PIC able to work on both 10MHz and 5MHz systems, I will no longer be distribuing a 5MHz firmware version. Those who wish to use a 5MHz OXCO must ground the PIC's pin 21 to enable the 5MHz mode. See the Additional Assembly Instructions section below. GPS_Std v3 (12/09/2008): Microchip have added a defect in their latest chip errata that affects newer batches of PICs. This bug will hold the chip in reset unless the power up delay feature is turned off (configuration bit CONFIG2L, bit 0). This bug is seen on chips with date codes greater than 0813 (2008, 13th week). So a new firmware is required to be fully compatible with the newer batch of chips. The firmware change is also fully backwards compatible with previous batched of chips. GPS_Std v2 (25/08/2008): Fixes a problem occuring on PICs programmed for the 10MHz OCXO frequency. The issue only affects the Voting mode. The Summing mode does not exhibit the problem. This faulty firmware will cause the DAC to over-correct the OCXO frequency, which will lead to a significant offset from nominal frequency or could prevent the FLL from locking. Note: Those who used the v1 file previously downloaded form this site do NOT need to perform the upgrade to v2, as the bug was introduced by mistake at a later date than the v1 file originally posted here. GPS_Std v1 (September 2006): Initial firmware release. The 7805 voltage regulator should be mounted with its case "grounded". A small TO-220 heatsink should be inserted between the PCB and the regulator case. A good example of a suitable heatsink is Digikey's HS107-ND. A small bead of heat-conductive paste should be applied to both surfaces. D1 should have its green diode anode soldered to the pad closest to resistor R3. For Digikey's MV6461A-ND, this is the longest lead. This orientation will make D1 come on as red-flashing-off at power up (assuming a valid 1PPS signal is fed to the system). D2 should have its anode soldered to the pad closest to resistor R9. For Digikey's MV5477C-ND, this is the longest lead. This orientation will make D2 come on as green at power up. Need a -5V supply? Do you use a MAX-232 TTL-to-RS232 conveter chip in the system? Here is an easy way to generate a -5V supply for the filter stage operational amplifiers U5A and U5B. Tap off the -10V charge pump supply from the MAX-232 TTL-to-RS232 conveter chip. Pass it through a 79L05 voltage regulator, Voilà! The amount of current available is limited though. Since the operational amplifiers' quiescent current is much less than 1mA, this leaves us with a few milli-amps of current to drive the VCXO. Check that the VCXO input tuning pin draws little current, a couple of milliamps maximum. Otherwise, the RS-232 negative voltage level will sink. This is not a problem with the HP oscillators since their tuning voltage input has an impedance of greater than 100K ohms. Low-voltage GPS Receivers: One user reported problems locking his 10MHz OCXO to a GPS receiver. The system would remain permanently in Holdover state, with wildly varying frequency samples as opposed to the more typical 26624 (0x6800) value. It ended up being an insuffucient voltage swing on his Motorola M12M's 1PPS signal. Always make sure that the PPS swing of your GPS is of TTL-grade with at least +4V on the high state, otherwise add some buffering. A NPN/PNP tansistor pair in cascade is a good way to restore the required swing for the PIC microcontroller. Alarm Latch Clear Pushbutton: In order to use the Alarm Latch clear push button feature introduced in the v4 firmware, a momentary SPST, normally open push button must be wired between PIC U4-pin 22 and any ground point in the circuit. No pull up resistor is required as there is an internal one assigned to the pin. Momentarily pressing on the pushbutton will clear any latched alarm. Of course, if the system is in Unlocked state, this action will have no effect. 10MHz / 5MHz OCXO frequency selection: Beginning in the v4 firmware, it is possible to switch to a 5MHz OCXO frequency instead of the more common 10MHz. A connection of U4-pin 21 to any convenient ground point must be made for 5MHz selection. By default, when the pin is left unconnected, its state is high and the 10MHz frequency is selected. No pull up resistor is required as there is an internal one assigned to the pin. The pin state is sensed by firmware only at power up. Toggling this pin during normal operation will have no effect. System in Initialization (Acquisition). This condition is normally seen after power up form a cold start. Using a sampling cycle size S of 10 provides a frequent DAC adjustment rate to quickly reach FLL equilibrium state (no more repetitive frequency adjustments in the same direction). The M of 2 (Sampling Summing mode) provides a more accurate trend feedback to FLL. System in Locked state (Stable). This setup is normally engaged after FLL equilibrium is achieved. Using a longer S sampling cycle size and a M of 1 (Sampling Voting mode) will allow to obtain optimized frequency accuracy. The system should normally be set as such for long term operation. VCXO's with positive tuning slope. An increased DAC tuning voltage will generate a increase in 10MHz output frequency. VCXO's with negative tuning slope. An increased DAC tuning voltage will generate a decrease in 10MHz output frequency. HP's 10544 and 10811 series OCVCXOs are of this type. Garmin GPS-25 / 35. This unit has spurious 1PPS frequency deviations that require a careful Holdover Limit parameter H setting. Refer to GPS receiver behavior comments below. Motorola Oncore GT+. This unit has larger sample-to-sample frequency deviations and require a larger Holdover Limit parameter H setting to avoid getting false Holdover transitions. Refer to GPS receiver behavior comments below. The bottom line accuracy is the result of several factors. The two most important ones are GPS 1PPS accuracy and VCXO stability. We know that the worst case accuracy of the 1PPS is 10-6. In practice though, short term GPS 1PPS accuracy is more like 10-7. Obviously, the longer you integrate the 1PPS GPS signal for, the better the accuracy will be. But the drawback of this is that the longer the integration time (averaging cycle), the more the VCXO will (or might) drift. Of course, the better the VCXO, the more stability you will get. But the overall bottom line system accuracy equation is challenging to specify, let alone quantify. I have measured on several occasions my system going into the low 10-11 and even high 10-12, but it did not stabilize there. Eventually, the VCXO drifted or the 1PPS pulled it away from there. I have made observations over several months, and concluded that the 10-10 decade (from 10-10 to 10-9) is a reasonable expectation from this system. Trying to shoot for better than this range would mean stretching the integration time to an impractical duration. Other disturbances like holdover and power outages would constantly interrupt your averaging cycle and make the FLL more or less useless. I found that an averaging cycle of a few hours is a good compromise. I guess it is like everything else in life: A good balance is the key! Another contributing factor to stability/accuracy is voltage regulation as a function of load current on the +5V regulator. A +5V variation will impact the PWM output amplitude on the PIC micro. It will also impact the offset applied to the operational amplifier to shift the tuning voltage negative in the case where you control a VCXO with a -5V to +5V tuning range. The single biggest contributor to load variation on the 7805 regulator is change to the 10MHz output terminations. I have seen variations of a few parts in 10-10 when disconnecting instruments form the system. The workaround to this (assuming this variation affects you) is to always put 50 ohm terminations on unused outputs. When adding an instrument, remove the BNC termination and connect the instrument. This will maintain a nominal current consumption on the output driver chip. Obviously, you will want to set the controller so that the outputs are always on. Other current consumers, such as the LED, the input driver and the decade counter do not affect stability in a meaningful manner. There is no doubt in my mind that some things could have been done differently to improve performance. I could have used an external DAC chip, I could have used an external voltage reference, I could have split the supplies with two or three regulators, and so on. This might have improved stability somewhat and would have made the board bigger and more expensive to put together. The original goal though was to keep the design as simple as possible, while still achieving 1x10-9 or better accuracy. That being said, those of you who operate a tuning voltage from -5V to +5V (and this is the case with the HP oscillators) - should try to center the tuning voltage at or close to 0V. It can be mathematically demonstrated that this is where the effects of the +5V voltage variations cancel out. For applications that require a 0 to +5V tuning voltage, obviously, the closest to 0V, the better. This GPS-derived frequency standard allows to perceive some differences in behavior of the GPS receivers 1PPS signal. Differences become visible when plotting the measured frequency samples (over 16-second windows, as provided by the system) when the system is in locked state and is stable. These differences result of different firmware algorithms used by different GPS vendors. After analyzing the cases below, the user will better understand the reasons for having a FLL Holdover state and the way to figure out what value to assign to the the Holdover Limit parameter H. I strongly recommend doing the same exercise for anyone using a different GPS receiver than the ones listed below. The first graph shows the Garmin GPS-25 / 35 firmware behavior for its 1 PPS signal when hooked up to the GPS-derived frequency standard. There is a large frequency deviation (sudden unexpected frequency increase) caused by a spurious slow down of the 1PPS GPS frequency. This kind of deviation occurs once or twice per day, on average. Note that frequency deviations in both directions are seen on the Garmin GPS-25 / 35 1PPS signal. The GPS-Derived Frequency Standard software must reject the frequency samples during this large deviation, otherwise the whole averaging calculation will be erroneous. This is where the FLL Holdover states becomes useful! Not considering this large deviation, the sample-to-sample frequency deviation stays roughly within +/-5 of nominal frequency (26624). This is considered to be regrouped. Medium-to-long averaging cycles should yield good system accuracy. The plot should give the user an idea of what value to assign to the Holdover limit parameter H. For this example, a Holdover Limit H ranging from 6 to 8 should provide good imunity to these spurious deviations, while still letting all good samples through. Our second example shows the behavior of the Motorola Oncore GT+ firmware for its 1PPS signal when hooked up to the GPS-derived frequency standard. Unlike the GPS-25 / 35 GPS, there is no large frequency deviation caused by a spurious variation of the 1PPS GPS frequency. With a GPS unit like this one, it is less critical to have a Holdover limit parameter H set quite tight compared to the sample-to-sample deviation spread. On the Motorola Oncore GT+ GPS , the sample-to-sample frequency deviation stays roughly within +/-16 of nominal frequency (26624). This is considered quite spreaded. With such a GPS receiver, for statistical reasons, a short averaging cycle is meaningless when trying to achieve optimal system accuracy. Only long averaging cycles will yield good accuracy. The plot should give the user an idea of what value to assign to the Holdover limit parameter H. For this example, a Holdover Limit H set to 18 or higher should provide good imunity to any unexpected spurious deviations. Note that, while some of these behaviors may look like GPS receiver defects, the frequency deviations still stay within the expected automotive-grade GPS accuracy of 10-6 (1ppm). Maxim's MAX232 chip. Two channels, which are required for GPS_Std system and GPS board. PICList Website. Various easy circuits and links for TTL-to-RS-232 conversion. The project started with a wish to make a GPS-derived Frequency Standard based on frequency measurement, as opposed to phase measurement, which is more complex in terms of hardware. Hopefully, a simple micro-controller would do the trick. In order to demonstrate the feasibility of such design, I build an instrument-based system controlled over GPIB using Labview, my all-time favorite control software. The figure below shows the instrument setup. Pretty quickly, it became obvious that it would work. Selecting the right micro-controller was the next thing to do. I elected to use a Microchip PIC 18F2220. It had built-in synchronous counter incrementing and latching via external signals, exactly what I needed! Though it lacked a DAC, it had a pretty decent Pulse Width Modulator that could produce a variable DC output with a suitable external low-pass filter. It also had serial port support. I had all I needed to make this project a success. Writing the firmware (software) was definitely the most tedious part of the story. All in all, I spent six months testing it, analysing the results, and increasing its functionality. As a side activitiy, I designed a PCB to host the components, built a prototype to prove it. I also wrote a Windows software to monitor and control the system in a more user-friendly ashion. I finally wrote a user manual, a magazine article and this web page. Honestly, the results are gratifying. I am quite happy with the final system. I hope you can sense the amount of perfectionism I put in that project.